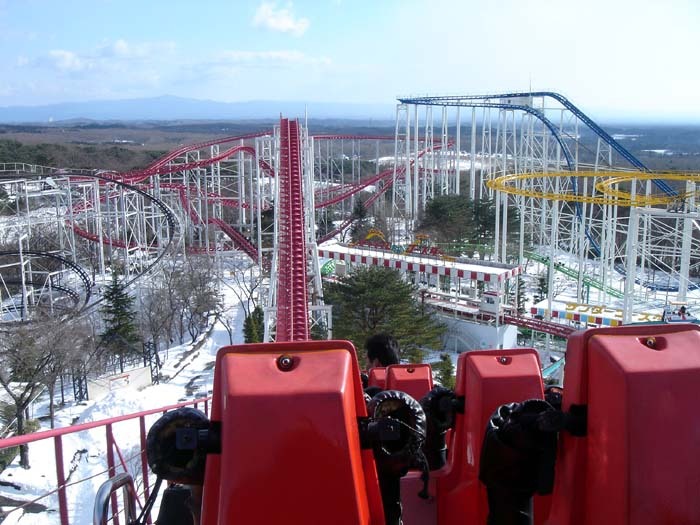 Day Ten - Nasu Highland or....our WEIRDEST park day...EVER!!! 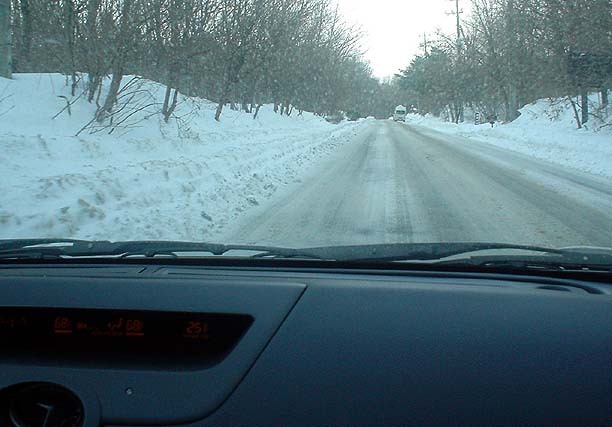 On our way to Nasu it got colder. And then getting into the town, it got "snowy".....A LOT snowy! Let's just say that getting to the park was an "adventure" in itself, and there was a point in which we almost turned back. But we knew that we were beyond the point of no return! The road getting to the park was "interesting." 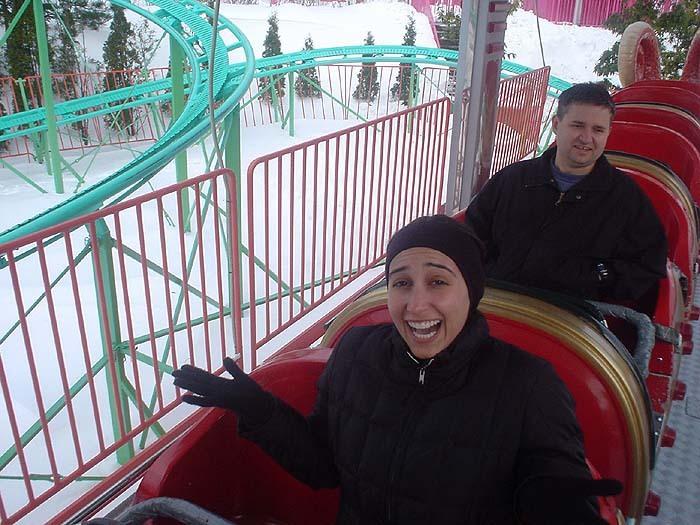 Normally, if this was just about anywhere else in the world, we would be on our way to go snowboarding, NOT roller coaster riding!!! 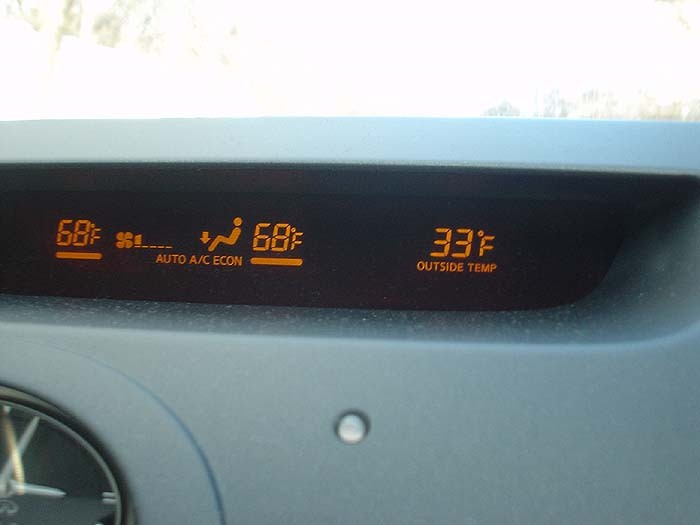 And yes, you read that correctly...the outside temp is only 24 degrees!!!! "Are we INSANE?!?!? What the HELL are we doing here????" While we wait for the park staff to vacuum the snow out of the trains (yes, you read that correctly) we were invited into the Lego display. I think that the "Panic Drive" was getting to the park! 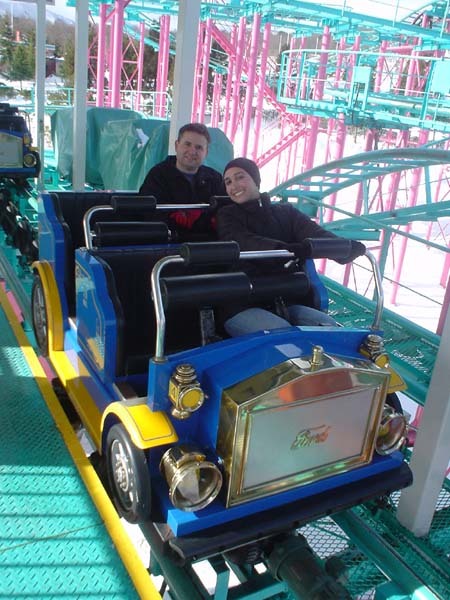 "Hey, if it will help get the coasters open faster, I'm willing to help out!" YAY!!!!! One by one most of the coasters started opening!!! 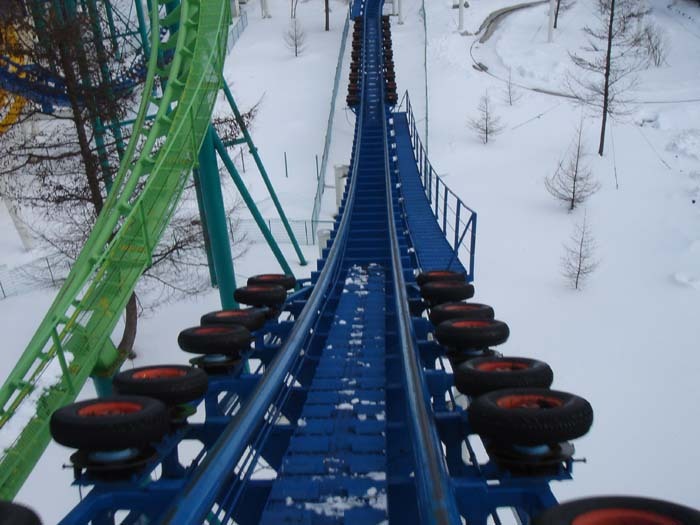 "I know, it's a powered coaster, but still IT'S A COASTER!!!! IN THE SNOW!!!" Yes! The read credits start to open! "WTF?!?!?!? 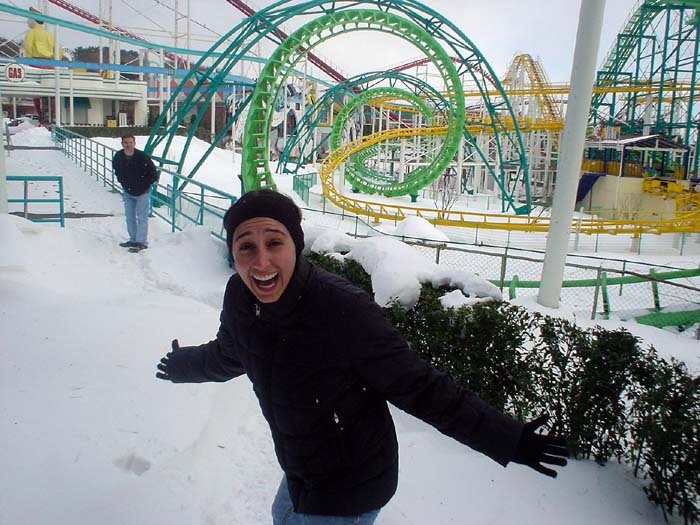 If this park can be open with 5 foot snow drifts why can't Cedar Point or King's Dominion be open during the winter?!?!?" 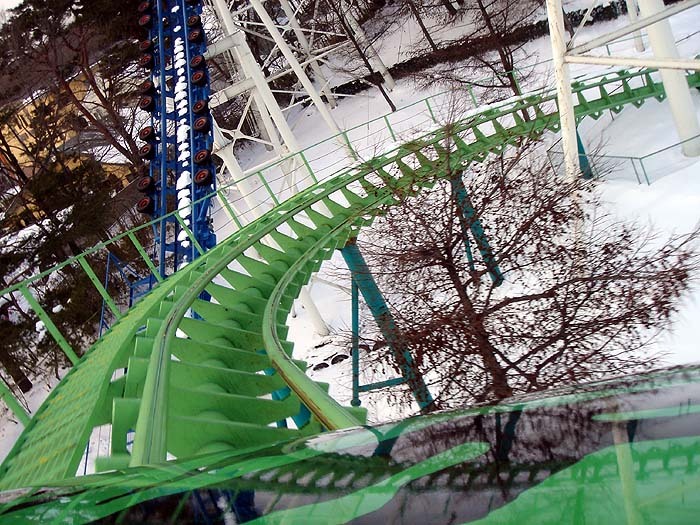 You can see there is still snow on the coaster tracks! And BTW, it's STILL snowing too, it's just hard to see in the photos. 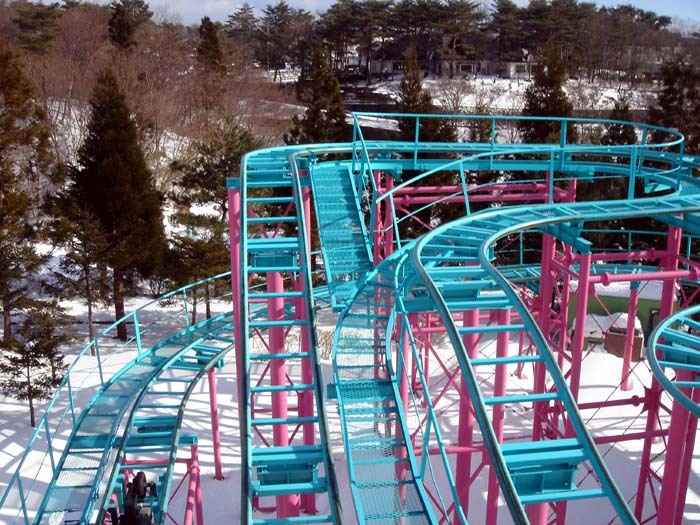 This is "coaster plaza" where the park has built 4 coasters right on top of each other! 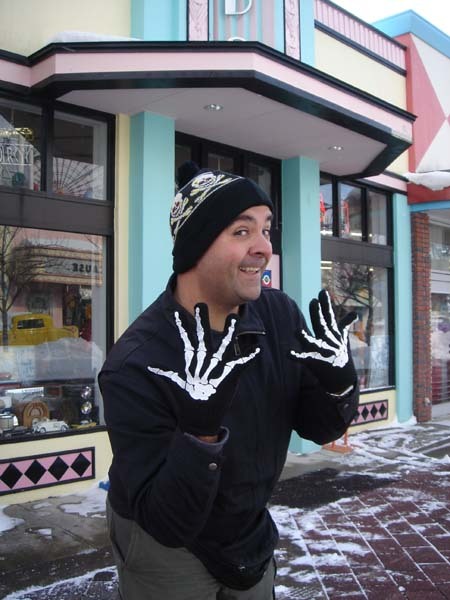 "Check out my new skeleton gloves!" 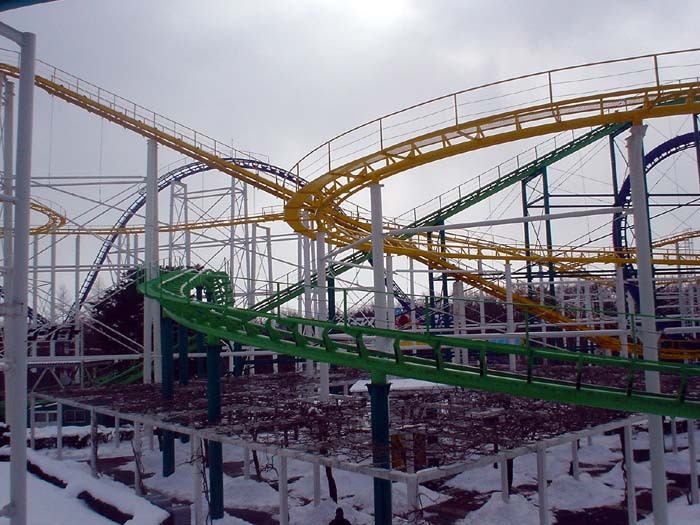 Camel Coaster (WTF?) 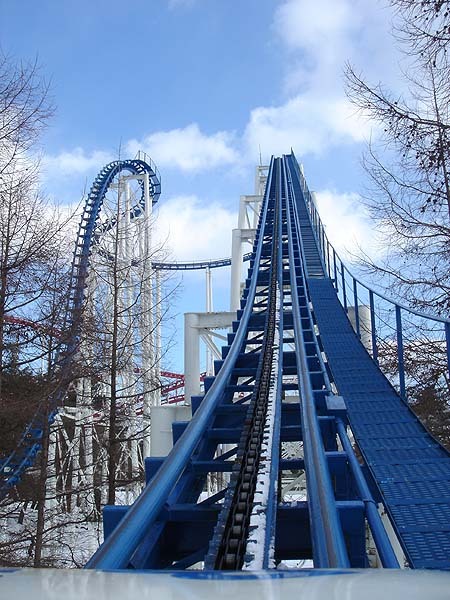 was one of those "Jet Coasters" that are REALLY long, but don't really do too much. 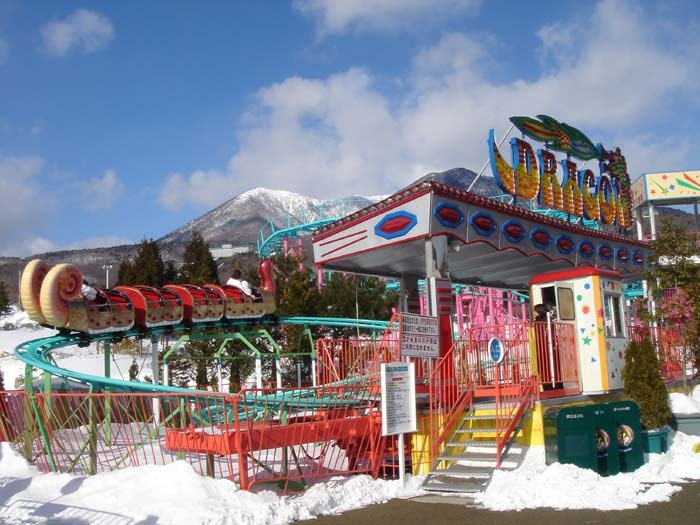 You can see that this ride goes all over the place. 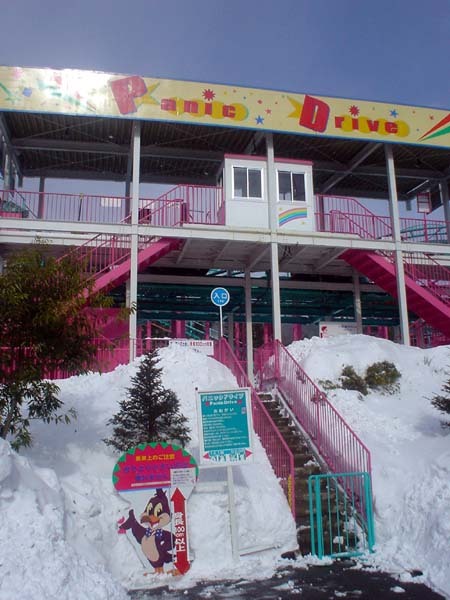 Panic Drive finally opens! 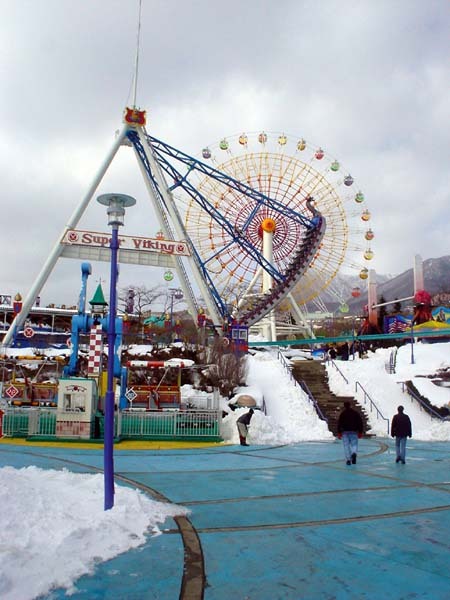 It wasn't as scary as sliding through the snow to get to the park! 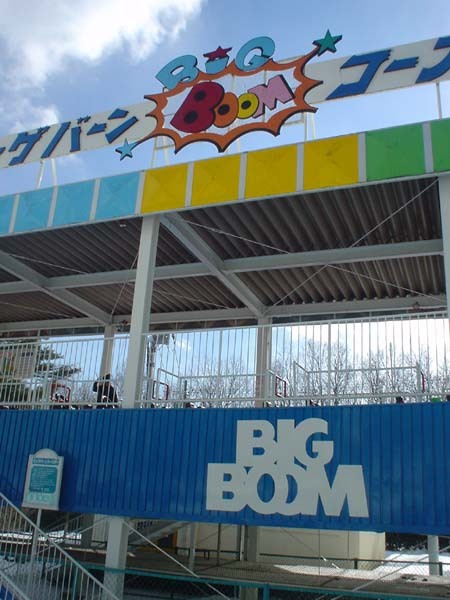 "Big Boom" was the best coaster of the day. 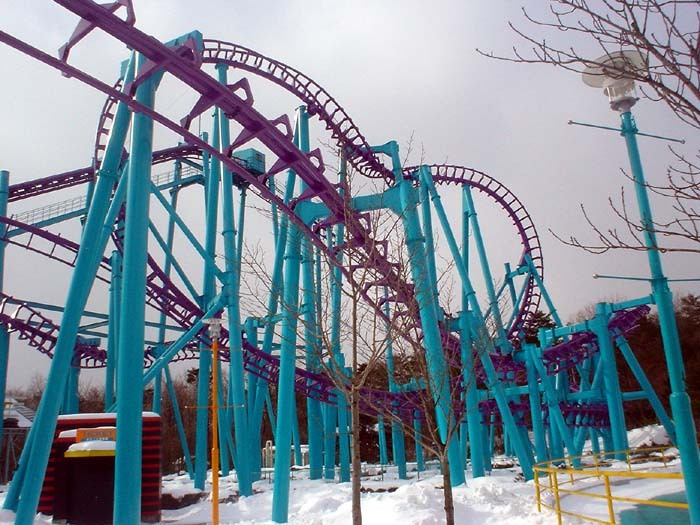 Not only does it have a really messed up name, but it had some crazy EJECTOR airtime! 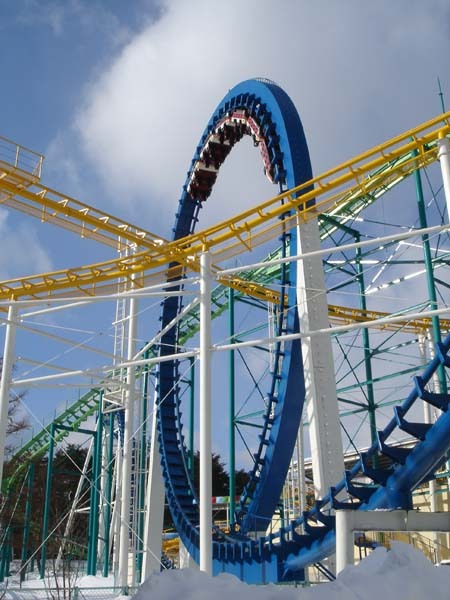 It also has something for Derek....A vertical loop!!!! "I have no idea how all those ACErs fit in these trains!" I'm not sure how steep this drop is, but it feels like it's about 80 degrees! I wish the weather felt 80 degrees!" Here we go up the snow-filled lift! See that drop? 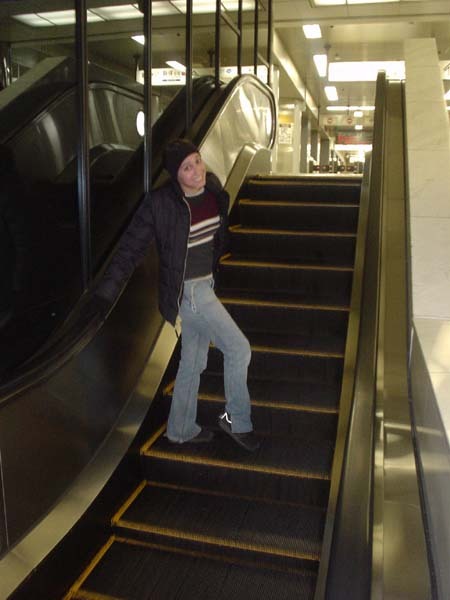 That's STEEP! See that snow? That's COLD!!!! "Tires...why did it have to be tires?" 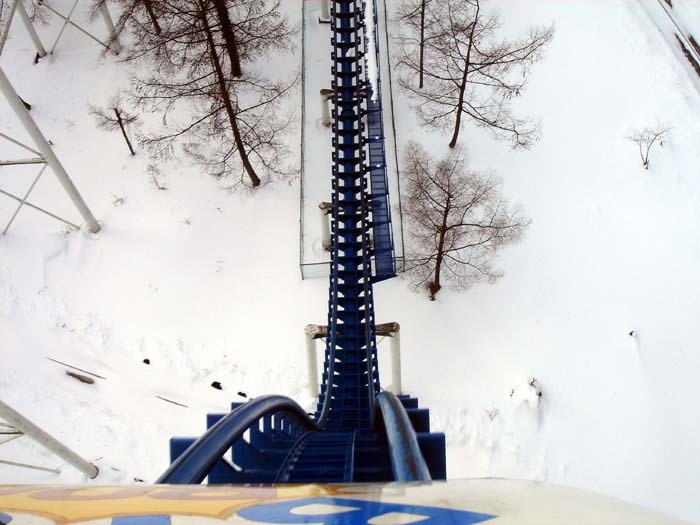 Can we just mention one more time how INSANE it is that they are running all these coasters in the SNOW?!?!?! 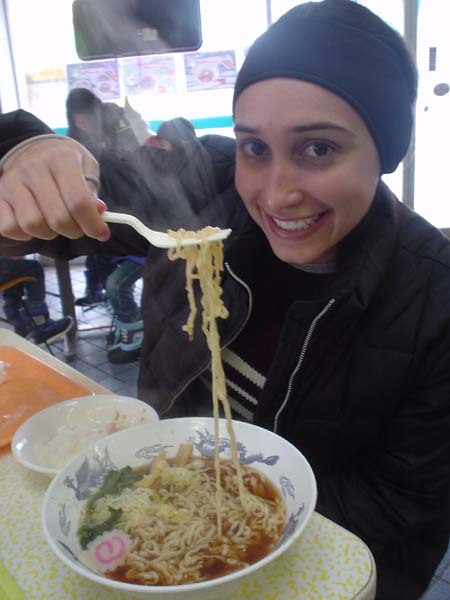 Once again, a sign that the world is nearing it's end when Elissa is eating "normal food"
Oh, darn. The SLC was closed. What a shame! =) If there had to be a credit to miss out on, I'd rather it be the SLC than anything else! 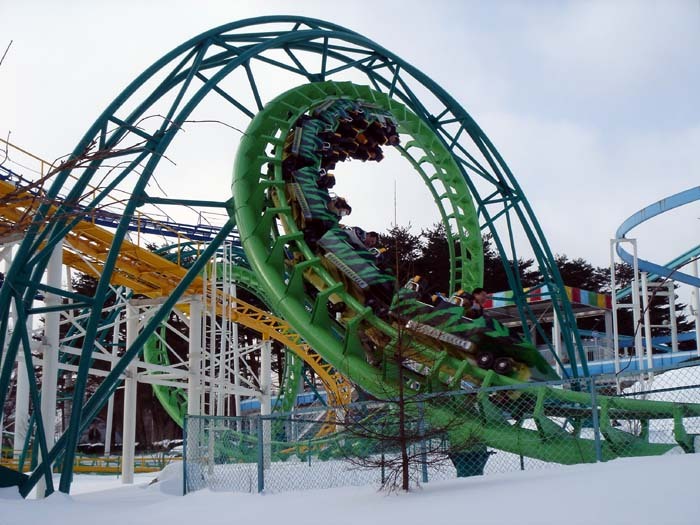 It was amazing that they had most of the coasters, flats, the space shot, etc open when there was about 20 people in the park and it was SNOWING!!!! The customer service in this country is so awesome. 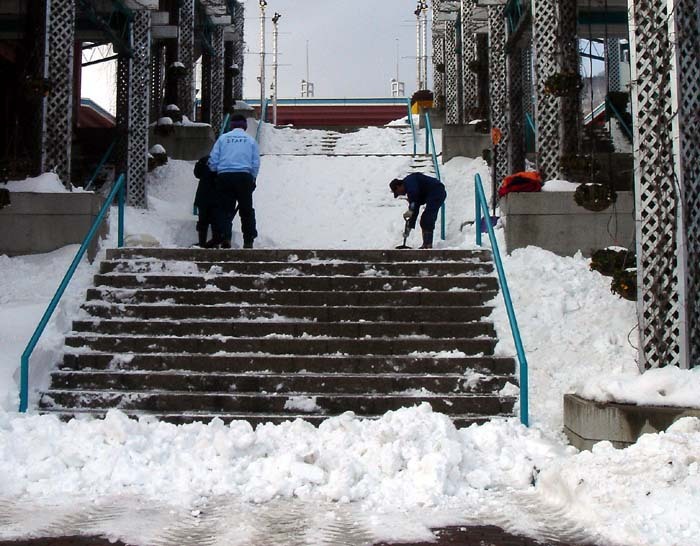 Tons of staff were out shoveling the walks as if thousands of people were going to show up today! 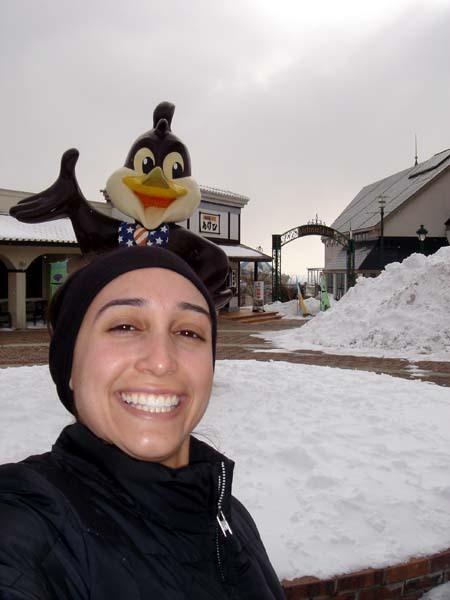 "Knott's Berry Farm closes the entire park in a light drizzle, but these parks are open in any weather conditions! I love Japan!!!" 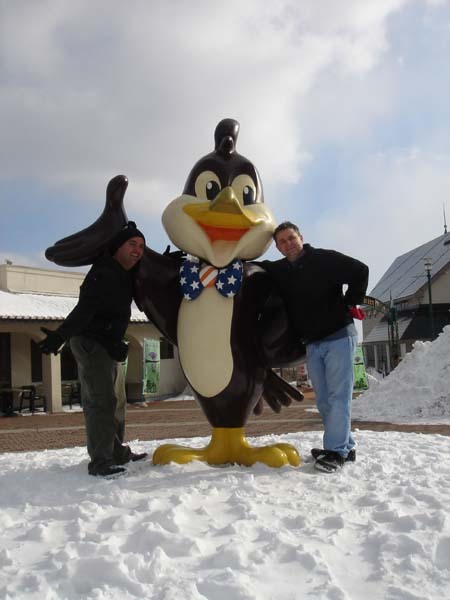 "Thank you Woopy for opening your park today! 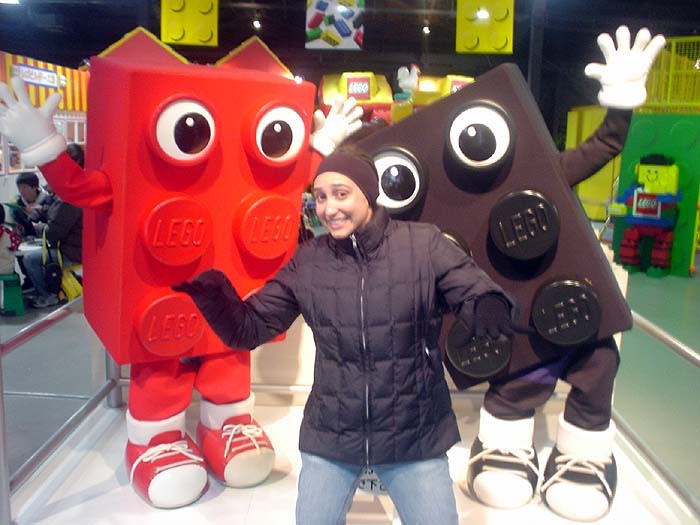 We had an awesome time!" We left our mark in the snow! Wow, I'm almost lost for words! WTF! The weather out here is warmer than that and there isn't even snow on the ground, but nooooo, everything's gotta be closed. Now I have a bad urge to go get some credits at Geauga Lake that I still need. 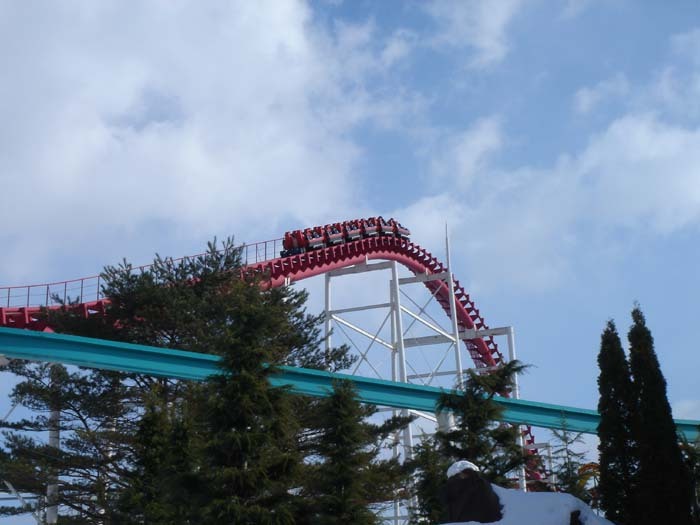 Anyway, I see that Lightning Coaster is still standing in the pic from Camel Coaster, did you happen to take a look at it? 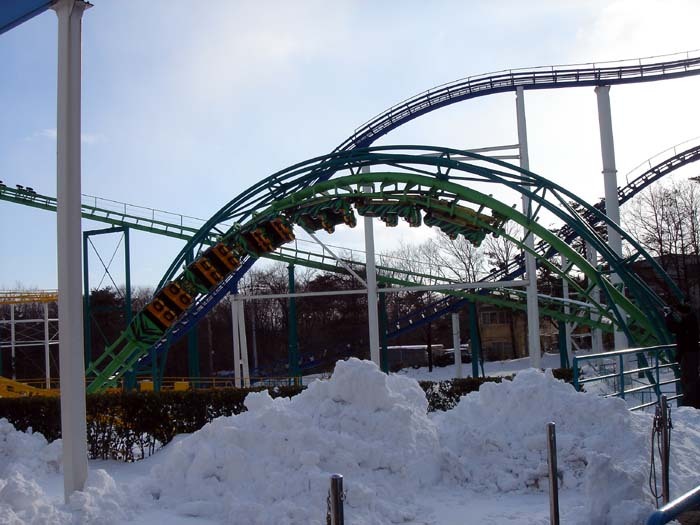 I know it's been SBNO for a long time but it's a shame to see a Schwarzkopf-designed coaster rotting where it stands. Jeez... Japan is so awesome! 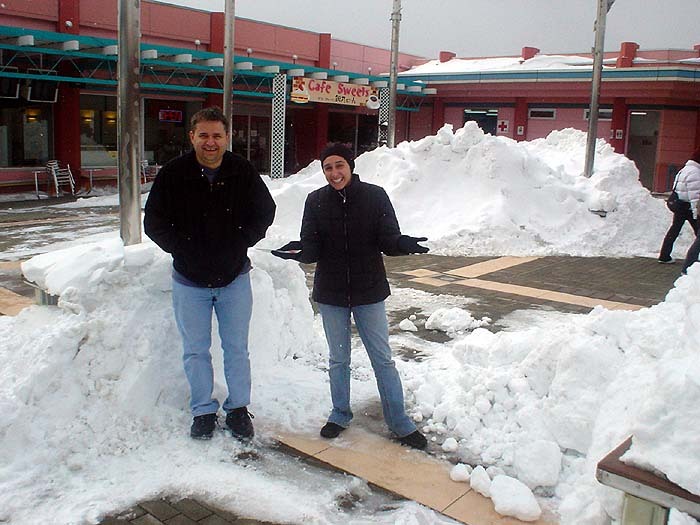 24-hour parks, parks open in snow... why can't American do this? 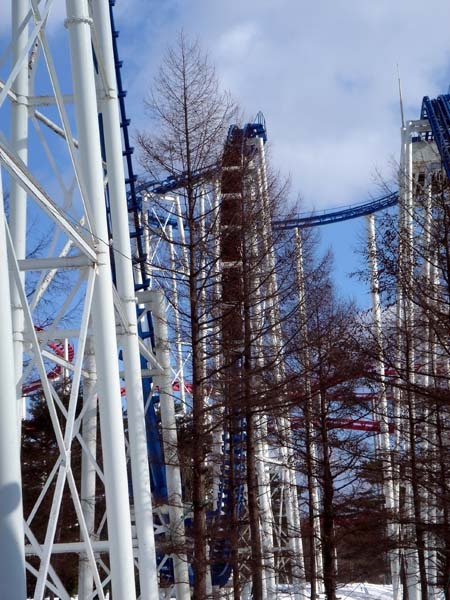 Great updates- the 80-degree drop coaster looks insane- and it has a really long train! I sure hope you used your fingers to write "TPR" in the snow instead of using another writing style. Was those Big Bird footprints as well? 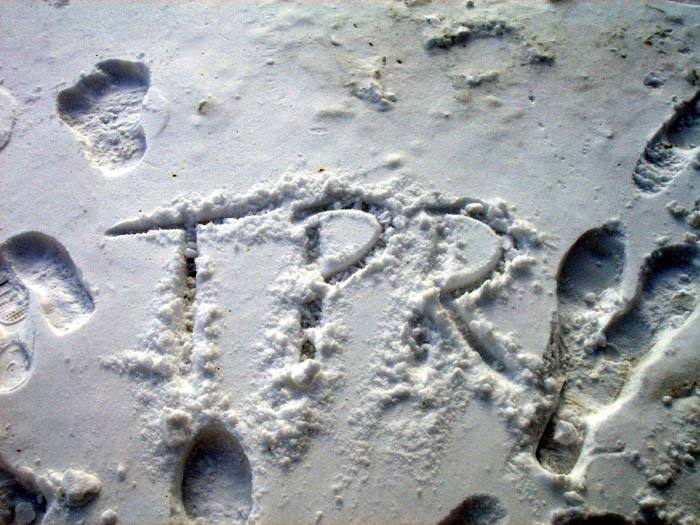 Erik Johnson wrote: I sure hope you used your fingers to write "TPR" in the snow instead of using another writing style. Well, you didn't see any yellow did you? 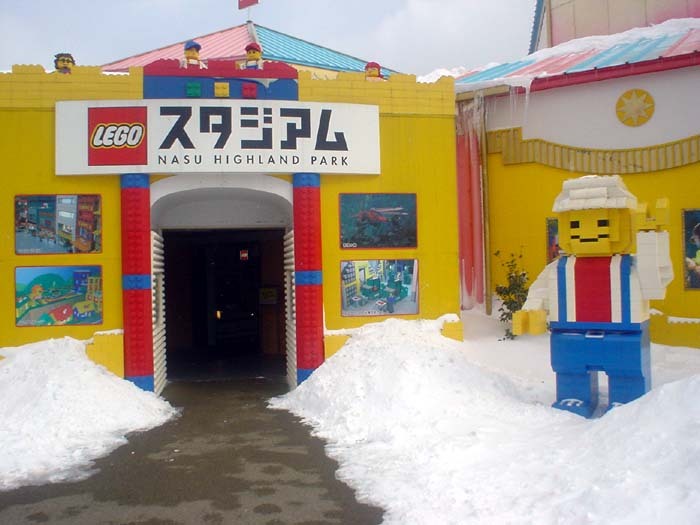 I guess Americans are too lazy to operate a theme park in the winter. Cool gloves Robb! They should match your plastic purple teeth from Boomers. 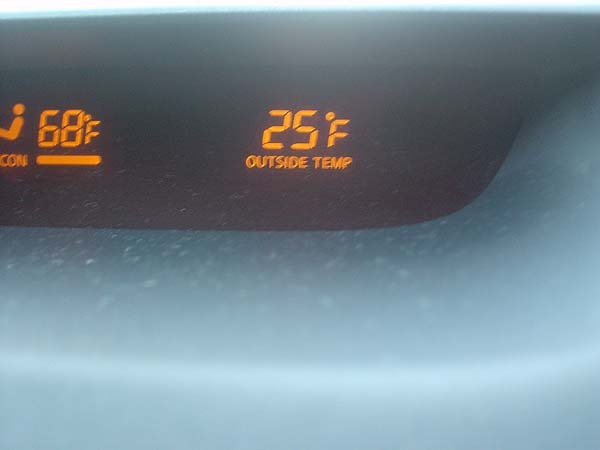 Twenty-four degrees? 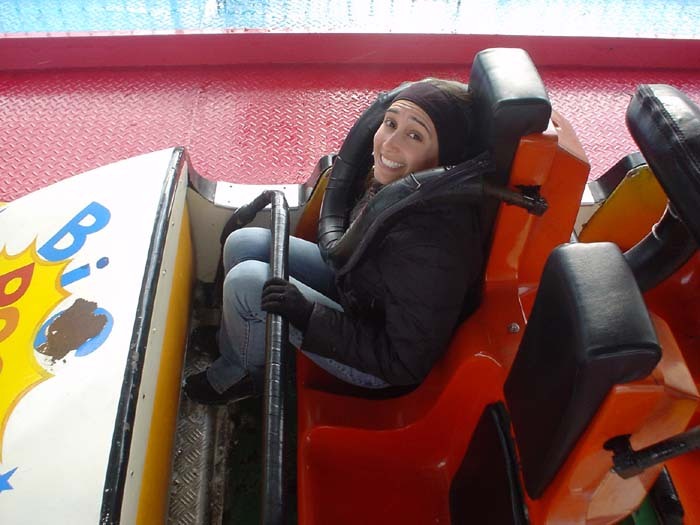 Sheesh, and I thought it was cold riding Top Gun during Winterfest at Carowinds on Dec. 10. I've always thought that BGW could pull off an excellent Christmas promotion--decorations and Santas from all the different countries, a cool Christmas train ride, not to mention excellent Christmas goodies from their bake shop or a nice dinner in the Festhaus. But I have mixed feelings about staying open all year. As I get older, I find that I enjoy deferred gratification--there's just something about opening day. Plus, Busch can do a lot of maintenance during the off-season. 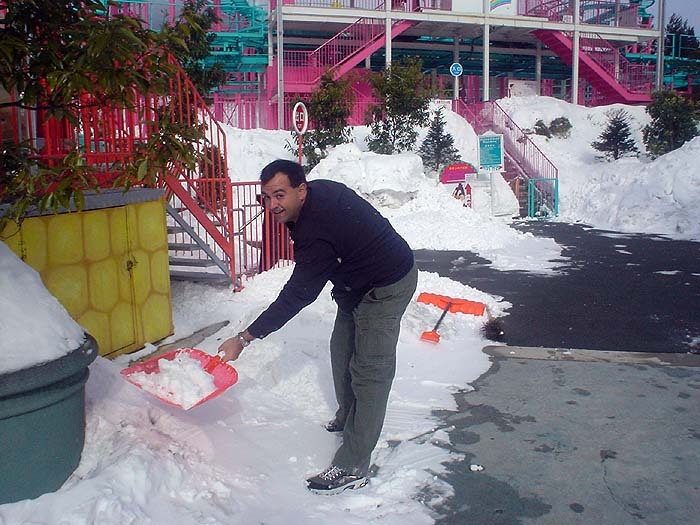 These parks do the maintenance too, they just do it one coaster at a time which is why the SLC was closed. But yeah, seeing the parks open here makes me realize there is no excuse why any park in the US couldn't be open all year round! I'm sure they have reasons, but looking how they do promotions all year round (Halloween, then Christmas, then countdown, etc) why can't the US parks do it too? Oh, well....at least I know there are parks open somewhere in the world other than CA and FL during the "off season!"